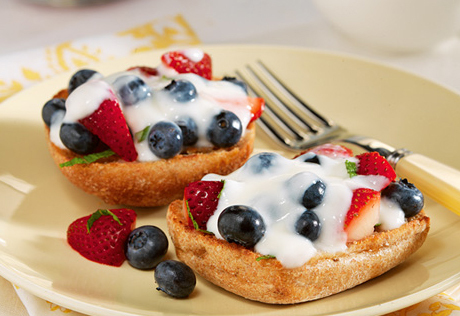 Fresh berries and yogurt are the perfect topping for honey drizzled wheat rolls...it's a perfect dish for breakfast or brunch, but also makes a tasty dessert. Keep the oven at 400°F. Remove the rolls from the baking sheet and let cool on a wire rack for 5 minutes. Cut each roll in half. Place the rolls, cut-side up, onto the baking sheet. Bake for 5 minutes or until the rolls are lightly toasted. Drizzle 1 tablespoon honey over the roll halves. Stir 1 tablespoon orange juice and the mint in a small bowl. Add the strawberries and blueberries and toss to coat. Divide the berry mixture among the rolls. Stir the yogurt, remaining honey and remaining orange juice in a small bowl. Spoon the yogurt mixture over the berry mixture. Serve immediately. Easy Substitution: You can substitute chopped fresh peaches for the strawberries.